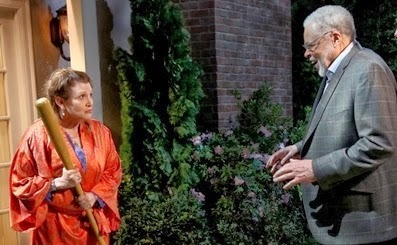 Princess Leia and Darth Vader, or should I say Carrie Fisher and James Earl Jones, face off once again on an upcoming episode of The Big Bang Theory! 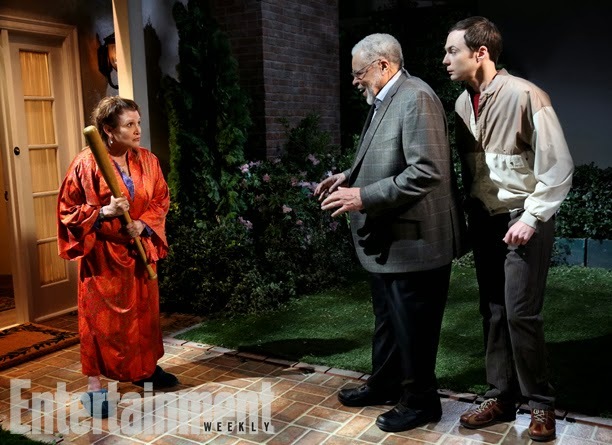 Entertainment Weekly has released a photo from the episode, which will air Thursday at 8pm Eastern, featuring James Earl Jones and Sheldon Cooper(Jim Parsons) staring down a less than amused looking Carrie Fisher brandishing a Baseball bat. In the episode, Sheldon fails to get tickets to San Diego Comic Con and he sets out to hold his own convention, leading him to seek out James Earl Jones as a guest. No word yet on how Carrie will figure into the story, but from the looks of it, it's going to get interesting. Star Wars are not going to want to miss this one, for sure! Check out a preview for the episode here!